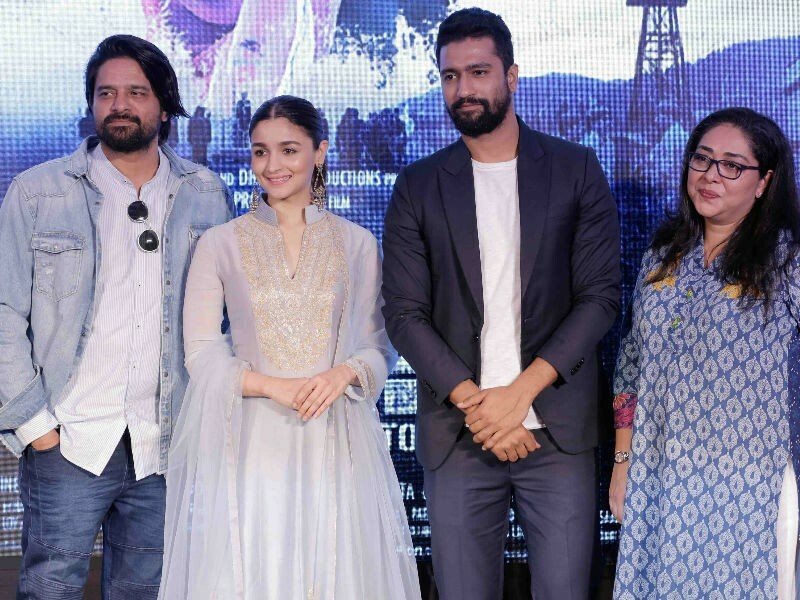 Bollywood actress Alia Bhatt and co-star Vicky Kaushal along with director Meghna Gulzar came together to launch the first song 'Ae Watan' from their forthcoming film Raazi on Wednesday, produced by Vineet Jain, Karan Johar, Hiroo Yash Johar and Apoorva Mehta under Junglee Pictures and Dharma Productions banner. The song, composed by Shankar-Ehsaan-Loy and sung by Arijit Singh. The film is set to hit the screens on May 11, 2018 and the stars are promoting it in a full swing. Alia Bhatt speaks about working with her mother Soni Razdan in Raazi movie. Alia says working with my mother in Raazi was a beautiful experience during Ae Watan song launch in Mumbai. She also said we made the movie in 49 days and we didn't expect such a beautiful response from all of you. Alia Bhatt, Vicky Kaushal and Jaideep Ahlawat pose together with Meghna Gulzar during Ae Watan song launch in Mumbai. Bollywood actress Alia Bhatt gets clicked on her arrival during Ae Watan song launch in Mumbai.